From Thomas Sabo is this stunning Pearl and Rose Quartz Charm Bracelet XS. A perfect bracelet to wear with any outfit. The Thomas Sabo Pearl and Rose Quartz Charm Bracelet XS features a Pink toned bracelet that is adorned with Rose Quartz beads. Spaced inbetween the Rose Quartz beads are 4 Pearl beads. 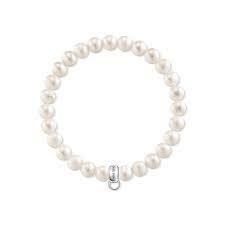 The bracelet is perfect for attaching your favourite Thomas Sabo charms and would be the perfect gift for her.